I have two delicious eggnog recipes to share with all of you this week. I know. I know. Some of you despise eggnog. You have told me on facebook, through email, and on twitter. It’s okay. 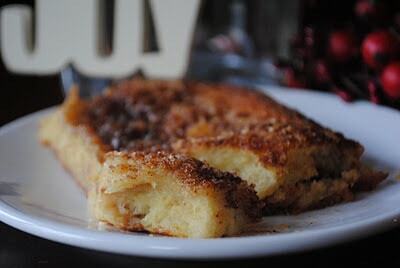 Take a break today and go read about this french toast casserole instead. You won’t hurt my feelings. Just don’t judge me for wanting to share my love for the creamy holiday drink! I made this for the kids one morning, and I think it was a hit! The youngest who doesn’t like eggnog didn’t even notice. Although, I thought it had a clear eggnog taste to the recipe, so don’t think you can fool people. She’s just fool-able (totally a word). Try making this for your next holiday brunch. Enjoy! In large bowl whisk eggs with eggnog, milk and rum flavoring. Dip cubed bread in mixture and place in 13x9 baking dish, until all bread is used. Pour any remaining mixture over bread. Sprinkle with cinnamon and nutmeg. When ready to bake, in small bowl mix melted butter with brown sugar. Pour over bread (sprinkle with pecans if desired). Bake uncovered in 350 degree oven for about 40 minutes. Enjoy warm! Omgosh…I love eggnog french toast! I make it every Christmas morning! I am one of the ones who LOVES eggnog…but only in small quantities and with rum:-) I could definitely go for some of this french toast too!!!! I’m thinking Christmas morning for sure!!! Just discovered your blog via pinterest!! This blog definitely makes me smile, I will be grab a cuppa now and drool over it for the next 2 hours!! Yum! 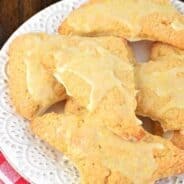 This recipe looks super delish!! I love that you added rum, perfect combo!! 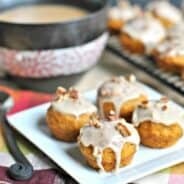 This recipe would make me want to wake up early and have breakfast! ohhhh yum, this looks RIGHT up my alley! I LOVE eggnog but never thought to use it for french toast. I will have to try this. 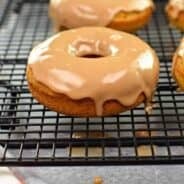 your eggnog donuts were ALREADY on my list of things to make and here’s another great one I want to try…keep up the great work! What a great French Toast for Christmas morning. We would really enjoy this great recipe. Thank you so much for sharing with Full Plate Thursday. Hope you are having a great week end and come back soon! Oh Wow! 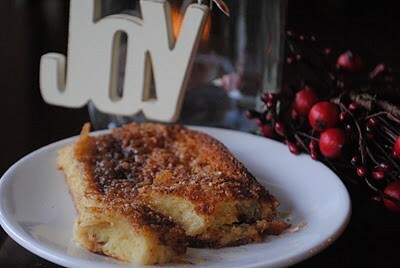 Your eggnog French toast sounds amazing! Thank you so much for sharing your creativity and talent on “A Little Birdie Told Me…” Tuesday at Rook No. 17! P.S. I’m featuring your recipe on my Facebook page today. I too love eggnog, but I’ll admit not all brands. My DH bought a pumpkin spiced type and I accused him of trying to poison me! So to those who hate eggnog, not all brands are created equal. Thanks for posting, I’ve saved it. Come by and take a peek at my blog and comment. – Love food blogs! won’t pin because no picture attaches….